Lee Boyd has recently collaborated on the exciting new Visitor Centre for Beefeater Gin at their distillery in central London which now provides visitors an insight into the history of gin and an understanding of the process of gin making. A bold new extension providing a point of entry to the centre, links the different parts of the distillery and allows visitors to move from the exhibition floor to the stills house without interrupting the day to day workings at Beefeater. Beefeater Gin: Beefeater Gin is the world’s number one premium gin and has been made in the heart of London for over 150 years, the only international brand to have its distillery in the capital. Beefeater is uniquely placed to call itself the Home of Gin and tell the intriguing story of the entwined history of London and Gin. Beefeater Gin is distilled in Kennington in South London where the new centre provides visitors with an insight into the history of gin, an understanding of the process of gin making and an opportunity to sample the unique product itself through a series of interactive exhibition spaces within the distillery. The culmination of the experience and where gin production can be seen by visitors is within the cathedral like Stills House. Lee Boyd and Four-by-Two: Lee Boyd from Edinburgh won a limited invited competition as far back as 2008 and joined design consultants Four-by-Two, based in both London and Edinburgh to tackle the challenge of integrating public facilities into the industrial distillery building. The emphasis on the team was to represent the strength of the famous Beefeater brand and provide an experience that met and exceeded current expectations for such ventures. This was the first time that Lee Boyd and Four-by-Two had collaborated and it was evident from the outset that the blend of skills and vision for the project would ensure a bold and ambitious proposition. 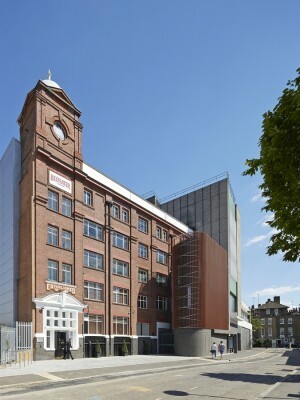 Challenge: The principal challenge for the design team was to address context by integrating the new visitor centre into a fully functioning distillery that combines industrial buildings from different eras and sits alongside active Victorian gasometers behind the famous Oval cricket ground. Lee Boyd was tasked with creating a new external building, providing a distinct point of entry for the centre and linking the two existing distillery buildings together with vertical circulation that would take visitors from the exhibition areas to the Stills House. Four-by-Two was to coordinate the design and interpretation of the exhibitions themselves and the integration of these within the shell of redundant parts of the distillery. Brand communication agency Contagious, also based in Edinburgh assisted Four-by-Two on different aspects of the exhibition design. 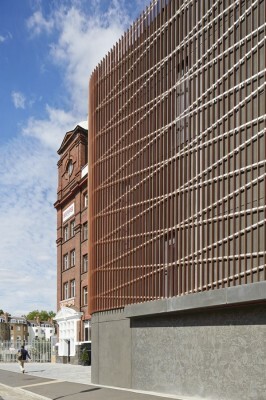 Context: Neither the 19th century red brick mercantile building nor the 20th century brutalist concrete building forming the Kennington distillery are of significant architectural merit, but through time have become integral to the diverse and eclectic fabric of the area which includes the gas works and the oval cricket ground. The introduction of a visitor centre at the junction of these two buildings was seen by Lee Boyd as the catalyst for conceiving an alternative language for a 21st Century structure and in doing so avoid, unnecessary pastiche. 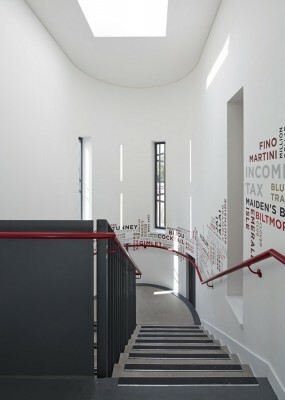 Language: The surrounding context is not consistent and overly suggestive in terms of appropriate language and therefore the concept of a more sculptural form, achieved using a contemporary approach, provided an interesting counterpoint to the more traditional industrial forms, rhythms and materials of the distillery and adjacent gas works. Taking this idea further Lee Boyd were keen for the new extension to retain an industrial sensibility and at a gentle level provide reference and resonance to the materiality of the gin stills and gas works, the geometries and rhythms of the gas works structure, the mannered facade of the 20th Century distillery building and the hues of the 19th Century building. Material and Form: The simple tower is formed in dark precast concrete that is honest to the functions of lift and stair, the essential elements contained within. 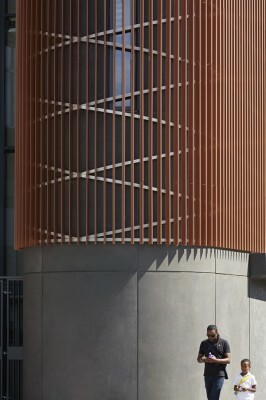 However the key architectural device is the over cladding of this tower with copper coloured fins that create an ever changing facade that has a richness through reflections, shadows and the visual dynamic you get with repetitive elements that are protruding and not flat. As visitors walk towards and then across the front of the building the fins change from presenting a solid appearance to one of transparency. This provides a reading of the structure behind and an understanding of the layering of fins and carriers. The carriers themselves in contrasting stainless steel, are angled off the horizontal to the line of the tower roof and set up a ‘criss-cross’ arrangement behind the vertical fins, that has resonance with the diagonal braced structure of the adjacent gas works. 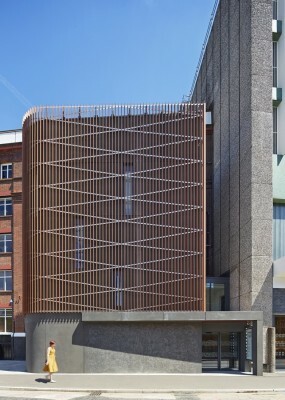 The form of the new extension is reinforced by the tentative connection it makes to the existing buildings. Where possible this connection in the vertical is made with glass to permit a continuation of the existing surfaces and to allow views in an out at these lines of transition. In the horizontal, roofs and canopies are kept to a minimum and in the case of the entrance canopy, it reads as a visual extension of the mezzanine floor. Lee Boyd’s choice of materials is inspired by both the utilitarian nature of the distillery and the industrial character of the imposing gasholder opposite, providing an arresting and very individual response to the challenges of the brief. Entrance and retail: Four-by-Two deliberately kept many of the building’s original features for this space. The huge existing roller shutter spindles, a slightly sloping concrete floor and exposed brick walls are all retained to maintain an industrial feel. Painted dark grey, they allow the new features to stand out, such as the red reception desk, illuminated product display walls and, at high level, a specially created stand-out installation using Beefeater bottle tops arranged to pick out the London skyline: emphasising the facility as the Capital’s own. The Beefeater and gin story: This is where the public really gets a chance to delve into the history of gin and how Beefeater and its founder, James Burrough, became an integral part of the gin story. This part of the visitor experience was led by brand communication agency Contagious and incorporates items from Beefeater’s archives in the creation of the self-guided exhibitions. Visitors get to learn about the infamous Gin Lane, where the dark days of the gin began. They will also understand how the influence of travel and trade led to the discovery of new flavours and spices from around the globe and the crucial influence they had on gin production. From cocktails at the Savoy Bar, to prohibition, via the story of how Burrough made his move from chemist to master gin distiller, right through to Beefeater today, these exhibitions are designed to immerse the visitor in the story of gin, and London. The cathedral-like Still Room: At the heart of the distillery, the visitor discovers the production process and gets to taste the end result. This space has been designed to retain its industrial feel, complimented by the addition of modern touches. Glass ceilings allow views up into the cathedral vaults of the distillation hall. Illuminated graphic displays highlight the botanicals that flavour Beefeater Gin. A shuttered concrete bar-front and contrasting black glass back-bar all add to the distinctly London look and feel, whilst visitors stir their tastes with a premium tipple.